This is the strangest music I know. It's hardly music at all. Those long wind things... the way the drum rattles in the middle of a prayer... the long roll of cymbals that brings everything to a climax. It is hardly music at all. It is as if the rock were singing; it is as if the wind and the rain were singing. It is not music: it is sound, essential sound. That description of Tibetan Buddhist ritual music comes from Andrew Harvey's classic travelogue Journey in Ladakh. 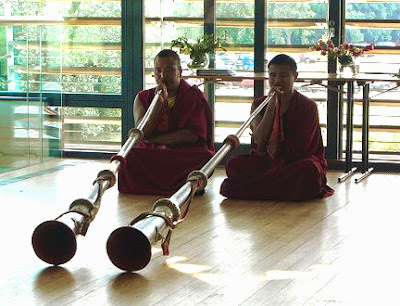 I took the photo of the monks of the Tibetan Buddhist Tashi Lhunpo Monastery playing 'those long wind things' - Tibetan long horns known as dungchen - in 2009 at the unlikely venue of Snape Maltings: for the full story see Wagner and the Tantric Orchestra. Increasingly classical music dwells in suburban comfort zones, but, as readers will know, those regions hold little interest for me. African American author John Francis has described how: 'The 'ragged edge' plays an important part not only in how sound comes into our awareness - haltingly at first - but also in how life works as a whole and how we learn and practice' and these days I send much of my time exploring those ragged edges. So no apologies for another path that ventures into the regions where music becomes sound, essential sound. In a wide-ranging interview Jonathan Harvey explained how: 'Energy is oscillation, largely. And when we say we are stirred by a piece of music, we’re excited, we are moved, and so on, we’re talking as if we are like a tuning fork which has been struck by some music, and it’s continued to vibrate for some time'. Digital dogma dictates that it is only the frequencies in music that are within the range of the human ear that can stir us. But there are compelling arguments that frequencies beyond the range of the ear leave us not only shaken but also stirred. An earlier post, which attracted much attention, examined the phenomenon of ultrasound - sound above the upper limit of ear - and suggested that to to listen to classical music you need a good pair of eyes. Now my explorations have taken me to the other ragged edge, where sound falls below the lower frequency limit of the ear - infrasound, also known as 'silent sound'. The lower limit of the human ear is around 20 Hz, but infrasound extends below this. Exceptionally low frequencies are generated by some percussion instruments and pipe organs. They are also generated by the Tibetan longhorns seen in my photo, which, due to their exceptional length, produce very low sounds. 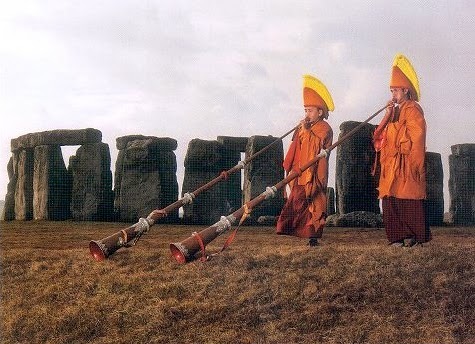 In ancient cultures instruments producing low frequencies were used for communication; because, unlike high frequencies, low sounds carry over long distances: for instance thunder can be heard 12 miles from its source. Infrasound is little understood and little researched. But there is evidence that resonances associated with the human cognitive system can be excited by infrasound. Research by NASA has identified that resonances within the human body lie within infrasound frequencies: for instance the resonant frequency of a seated human body - ie a concert audience - is between 4 and 5 Hz, giving credence to the expression 'feeling the bass'. Of particular interest is the complex area of brainwaves. The frequency of these is well established. Gamma rhythms above 40 Hz lies outside the infrasound range and are associated with high-level information processing. Below this Beta rhythms of 13 to 30 Hz are experienced in normal waking consciousness, while Alpha rhythms from 8 to 13 Hz - the brain's resonant frequency - are generated in a relaxed but awake state. Theta rhythms from 4 to 7 Hz appear in the drowsy twilight state between waking and sleep and are also associated with meditation and trance states. Paths converge here because, as above, the resonant frequency of a concert audience lies within this range, and Theta rhythms are associated with hypnagogia. This is the semi-dream condition which has inspired masterpieces including the opening of Wagner's Das Rheingold - see my post Was Wagner a Sufi? - while Theta rhythms are also associated with trance states. Finally, Delta rythms below 4 Hz occur in deep sleep and have also been linked with subliminal experiences and higher levels of consciousness. Laboratory experiments have shown that drumming affects the electrical activity in the brain. This has led to the theory of auditory driving which proposes that rhythmic low frequencies can 'drive' brainwave frequencies down. Which, if correct, would explain the ability of music to induce trances in Sufi and other rituals. The theory of auditory driving (or brainwave entrainment) has received some academic support but remains contentious. However, the similar theory of photic driving, whereby strobe lights can trigger dramatic changes in the human brain, is medically accepted. Yet more paths converge here, as the conversion of light into other sensory impulses in photic driving has similarities to synaesthesia; this is the condition prized among classical musicians whereby information can switch from one channel (hearing) to another processing track (sight). Jonathan Harvey explained how he was influenced by Rudolf Steiner's theory that the whole of life is based on energy of a certain character and colour, and how Steiner could see these colours with his auric vision. In these days of 'cutting through classical' I am sure talk of coloured energy and auric vision will have forced many readers away. But to those that are still with me, I suggest that an understanding of auric vision may lead to an understanding of where classical music is going wrong. An aura is defined as the distinctive atmosphere or quality that seems to surround and be generated by a person, thing, or place'. The aura that surrounds classical music is highly complex and little understood. It comprises the sounds that the ear can hear, and the infrasound and ultrasound it cannot hear. Music's aura comprises esoteric acoustic principles and arcane performance conventions. And it comprises much, much more. Today, commercial imperatives dictate that classical music must be reduced to a frequency limited audio file, a 140 character tweet, or a vacuous intro by a BBC Radio 3 presenter. You don't need to be a disciple of Rudolf Steiner to understand that when that happens, nothing is left of the all-important aura. Well-meaning but misguided attempts to make classical music more accessible by simplifying it are the equivalent of capturing a fierce, proud and wild tiger and locking it in a zoo cage. This path poses more questions than answers. For instance, does the ability of headphones to transmit lower frequencies by bone conduction explain why live classical music does not connect with younger audiences? And does the little understood importance of infrasound support the argument for experimenting with judicious amplification and bass enhancement at classical concerts? I am well aware that some will deride me for venturing into the mystical at the expense of scientific rigour. To which I respond, quite possibly true; but this path still exhibits considerably more scientific rigour than the fashionable theories peddled by classical music's many other saviours. Today's post is work in progress, and, be warned, more on infrasound and related phenomena will follow. Fortunately, others are pursuing parallel paths. Paul Devereux's book Stone Age Soundtracks is regarded with scepticism by some academics, but, despite this, is thought provoking. I have previously written about Eliane Radique's visionary electronic soundworld that impinges on infrasound. For me, the highlight of the 2014 Aldeburgh Festival will be the performance by Exaudi and Russell Haswell of Antoine Brumel’s Et ecce terrae motus (Earthquake Mass) juxtaposed with electronic infrasound. 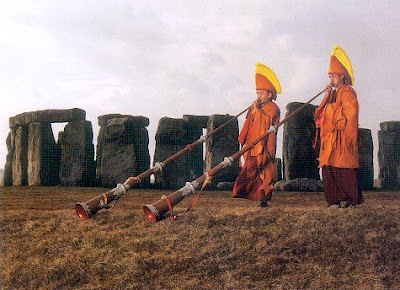 For those wishing to explore infrasound from a binary source I recommend the CD Dawn to Dusk by the Tashi Lhunpo monks, who are seen below at Stonehenge. No review samples were used in this post. Any copyrighted material on these pages is included as "fair use", for the purpose of study, review or critical analysis only, and will be removed at the request of copyright owner(s). Also on Facebook and Twitter. As to, "I am well aware that some will deride me for venturing into the mystical at the expense of scientific rigor." - My feeling is that the situation is like Clark's idea, "Any sufficiently advanced technology is indistinguishable from magic." I think music is a much more advanced technology than empiricists appreciate, that in time there'll probably be empirical expalnations to what we now call "mystical". Just because they haven't figured out all that's going on doesn't mean it's not happening. On a personal note - some years back some Tibetan lamas let me try one of those long horns after a concert. I'd never attempted brass before, but got a pretty good tone and loved the feeling. Got a French horn and it's provided the most amazing musical experience I've ever had - playing in the Brahms Requiem. I think a lot of what's going on is akin to the bone conduction you mention - somehow the sound of the horn is both in the air and in me.